According to legend, a man named James Burne Worson of Warwickshire, England got a little tipsy one day and, in his usual bravado, accepted a strange bet in his drunken state: he agreed to run all the way to Coventry and back (a distance of some 40 miles). The race, however, was never finished. In Ambrose Bierce's story "An Unfinished Race," Worson sets off on his run on on the third day of September in 1873 along with a few witnesses following in a wagon. According to these witnesses, the man took off at a good pace and all seemed well — until he suddenly fell forward and disappeared: "the man seemed to stumble, pitched headlong forward, uttered a terrible cry and vanished! He did not fall to the earth — he vanished before touching it. No trace of him was ever discovered." This tale was one of many very short articles Bierce collected in an updated edition of his 1893 book Can Such Things Be? The book included several similar examples of local lore or legend, allegedly based on true stories. "An Unfinished Race" was the among the shortest at only three paragraphs. It was also at the very end of the book, filed under a heading of "Mysterious Disappearances" added specifically for the 1910 edition of his collected works. That particular multi-volume complete edition of Bierce's writings was, ultimately, a failure. Even so, when the final volume of the 12-book set appeared in 1912, Bierce wrote: "The completion of my 'collected works' finishes (I hope) my life's work. I am definitely 'out of it,' unless some irresistible impulse comes to me, which is not likely." 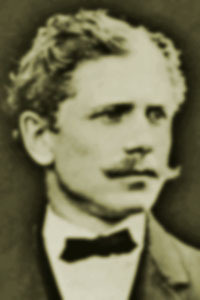 Ironically, Bierce would later become a mysterious disappearance story of his own. *Some information from this post comes from Ambrose Bierce: Alone in Bad Company (1999) by Roy Morris, Jr.